Powder 8 at the base of Beaver Creek is packed with an apres crowd while Shannon Tanner belts out familiar tunes on Wednesday afternoon. Tanner has been performing at the Park Hyatt for 25 years. 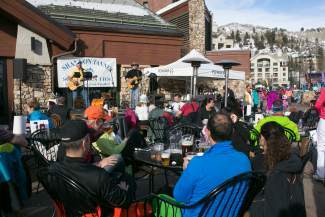 Shannon Tanner performs Tuesdays through Sundays outside at Powder 8 at Beaver Creek from 2 to 5:30 p.m. (2:30 to 5:30 p.m. if the performance is indoors). Tanner plays mostly cover songs with a few originals from time to time. When entertainer Shannon Tanner first started performing at the Park Hyatt, there were only three buildings at Beaver Creek and the cost of gas was $1.12. 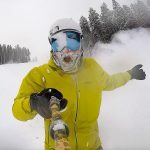 Now, 25 years later, he’s still performing his high-energy, crowd participation show outside of the Park Hyatt and Powder 8 at the base of the mountain. Along the way, Tanner has welcomed some great musicians to his small stage near the Centennial Express Lift. From Toby Keith standing in for a song to Dan Fogelberg signing his guitar, Tanner is honored to be part of the entertainment scene at Beaver Creek. Tanner performs a lively show including mostly cover songs, which get the crowd involved and singing along. He’ll mix in a few of his own songs from time to time, as well. He moved from a small island near Hilton Head, South Carolina, to the Vail Valley for a business pursuit with a friend. He was performing at Beano’s when the general manager of the Park Hyatt asked him about switching locations. Tanner jumped at the opportunity, and now he’s seeing the same faces year after year, with some kids in the crowd now grown up and bringing their kids to the show after a day on the slopes. “When you’ve been somewhere for 25 years, you become ingrained in people’s life experiences,” he said. The Park Hyatt has seen multiple renovations in Tanner’s tenure, including a name change from McCoy’s to Powder 8, but the entertainer has been a constant staple at the hotel. What’s next for the 51-year-old musician? Well, Tanner’s still enjoying his time entertaining crowds at Beaver Creek, and he’s looking forward to it lasting longer. “It becomes a party atmosphere every day,” he said.